Eating a fruit and vegetable diet doesn't restrict you to becoming a vegetarian. Instead, it means including a minimum of five combined servings of fruits and vegetables in your daily diet as part of a healthy eating plan. For years, people have argued over which is more nutritious, fresh, frozen or canned fruits and vegetables. 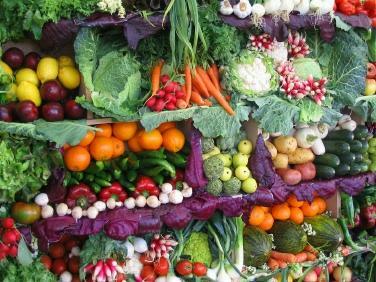 Many believe that fresh vegetables and fruit are the most nutritious. Surprisingly, this is not necessarily the case. Unless fresh fruit and vegetables are eaten immediately after being picked, they may lose much of their nutritional value. Shipping time, long storage and severe temperature changes reduce nutrients found in fresh fruits and vegetables. Vitamin C, for example, is very sensitive to changes in temperature, light and atmosphere. Just two or three days stored at room temperature can reduce vitamin C by 50 percent and folate by as much as 70 percent. Technology, such as flash freezing, allows us to have fruit and vegetables year round that are full of nutritional value. When flash frozen immediately after harvesting, nutrients remain trapped until eaten. Adding fruit and vegetables to your diet does not have to be boring. Try some of the following tips to add interest and taste to your diet. Choose a variety of fruits and vegetables. Add vegetables of different colors for added nutrition and flavor. Look for dark green leafy vegetables, and fruits and vegetables in red, yellow, orange, green and purple. You are more apt to eat fruit if it is out where it can be seen. Keep it on the counter, tabletop or in the front of your refrigerator. At each meal try to fill half your plate with delicious vegetables includes stir fry dishes and salads. Dried and dehydrated fruit is easy to carry with you for a quick snack. Instead of potato chips have freshly cut vegetables and a low fat dip for a delicious snack. Replace chocolate candy with strawberries covered with dark chocolate. Freeze grapes for a delicious quick-frozen treat. Both fruits and vegetable are best eaten raw. When cooking, steaming or baking is better than boiling. Leave out the butter or oil when cooking vegetables. From vegetable and fruit recipes to healthy tips and nutritional values, the Internet is loaded with websites full of information on the importance of eating fruits and vegetables. Add a rainbow of colorful fruits and vegetables to your diet. What color is Your Food is an excellent website with fruits and vegetables listed in color groups. Lists of the nutritional values of fruit and the nutritional values of vegetables is offered by Bella Online. A fruit and vegetable diet is rich in nutrients that are essential to a healthy body. Eating a minimum of five servings per day reduces the risk of many chronic diseases..